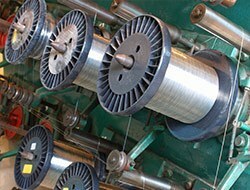 A&A Coatings has been experimenting for over 20 years on a new friction lowering technique by coating wire drawing capstans, pulleys and other components with low friction, non-sticking, abrasion resistant mixtures. Finally, A&A Coatings has perfected a mixture, trademarked Wirewear® coating. This new material shows a substantial improvement in the manufacture of both ferrous and non-ferrous wire for size ranging from .031 to .375. The coating is hard and abrasion resistant and the surface of the coating exhibits a low coefficient of friction with the added advantage of increasing hardness in service. Wirewear® coating also demonstrates impressive elasticity for a coating material this hard. This property allows for a virtually crack-free surface on both new and reconditioned capstans. Pressure on wire drawing dies coupled with the high speed that the wire moves through wire drawing machines produces large amount of heat due to friction. Until recently, there were only two practical solutions for lowering wire drawing friction. One was the use of special lubricants between the moving wire, the dies and the wire drawing block. This technique has certain physical limitations. The second was slowing down the drawing machines thus reducing production output. A&A Coatings can also provide wear resistant coatings to improve the performance of other components in the wire processing industry. These include sheaves, pulleys, rollers, rings, guides and annealer pulleys as well as capstans and blocks. A&A Coatings has more than 50 years of experience supplying coatings to the printing, packaging, semi-conductor, power generation and many other industries. Please contact us for more information.